Entire Villa, Affordable, Near Atlantis & the Best Beach & All! 1 Bed,1 Bath; 2 Minutes to Beach, Atlantis, Ashram Yoga, Casino, Golf & Shops. Paradise Island charming, clean and bright apartment in the best location ever; the best beach is literally just about a 7 minute walk . Walking distance to Atlantis resort and casino, the luxurious One & Only Ocean Club resort, Ashram yoga, spas, golf course. Conveniently located near to convenience stores, liquor store, banks, shops, nightlife, coffee shops, bars, casual and fine dining restaurants and last but not least; the best beach..
Tiled throughout, this property is fully furnished, has central air-conditioning system, hot and cold water, Free WiFi, flat screen TV, and more in the unit. Other amenities includes swimming pool, on-site laundry room and free parking on the premises. Within a 7 minute walking distance, you will find all water sports including sailing and water-skiing on 500 foot private beach. There is also the Atlantis Resorts and casino, water parks, marinas, duty free shopping, casual and fine dining restaurants, bars, various nightlife, spas, the yoga retreat, and a beautiful 18-hole championship course. Downtown Nassau ( the capital) is only a 10 minute taxi or ferry boat ride. Check in is 3pm or after. A hospitable Bahamian born and raised in Nassau, and have lived here most of my life. Professionally, I work mainly with expatriates almost daily and I thoroughly enjoy it, because I love meeting people from all walks of life. Paradise Island is safe, clean, quiet, scenic community with reliable utilities. The condominium complex itself is small and quiet. Fully equipped and basically supplied kitchen (tea, coffee, cleaners, etc), living room, cable tv, wifi, parking, central a/c, washer/dryer (on property) , towels, shower curtain, bath mats, complimentary shampoo and bath gel , 100% cotton bedding. It is centrally located between all the resorts on Paradise island. 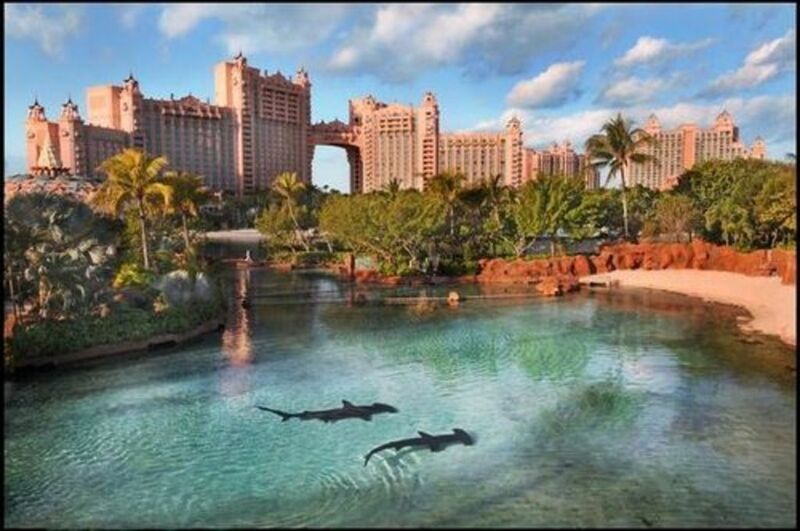 An easy walk to the Atlantis resort, luxurious One & Only Ocean Club, golf course, spas, convenience store, shops, nightlife, restaurants, casino, banks, hotels and the beaches. The condo is an easy walk across the street to Cabbage Beach which is situated along the stretch for Atlantis, RIU and One and Only Ocean Club and other small hotels. If you are like me and prefer the beach instead of the pool you will find that the beach is made soft sand, clear turquoise blue water, aside from swimming, it is ideal for a picnic and people watching. Ferry boats to Nassau Island, Bay St. shops, Straw Market, Bahamian crafts market, cruise ship harbour, Arawak Cay (Fish Fry) horse & carriage rides, restaurants and hotels, Government House, Historic Charles Towne, National Art Gallery, Nassau's oldest churches, Courts, Parliament, Rawson Square, the Public Library, banks, 30 minutes from airport. Nice unit and Tam was great. Good communication and always available if I needed anything. Great location and access. Would stay again. We thoroughly enjoyed our stay at Paradise Villas. We had the beach to ourselves with nice snorkeling on the east end of Cabbage Beach, absolutely beautiful beach, water, and walk. Very easy walking, eating, drinking. The villa is great for hanging in as well. Back porch for dining and lizard watching. The pool, outside our door, very clean and refreshing after a day at the beach. Tam is the ultimate host, with much information for your stay. She knows her Island well, and will respond immediately to your inquiries. She arranged a taxi for us, complementary breakfast, and “island ease” for a most relaxing stay. The reason we booked? The reviews. All said they’d return. Us too,. Thank you Tam. I would like to say from the beginning to the end of our stay was awesome. Tammy the owner of the property where we stayed at was an excellent host from the first day to the last day. The area was quiet nice, clean , and peaceful and just what we needed. The places where we walk to which was about a 12 to 13 minute walk was worth the walk. I will say though it is expensive so make sure when you go you have plenty of funds . I recommend her and her place to stay if it’s justTwo of you going together again the best anniversary and birthday getaway I’ve had. We absolutely enjoyed our stay at Paradise Villas. The location was perfect. You could take advantage of the amenities of Atlantis, while not feeling guilty about going off property. Tam was great! She was unbelievably thorough in the preparation she provides. We would definitely come back! We loved our stay in the Bahamas. Our stay in the Bahamas was great including our accommodations at Paradise Villas. Tam, owner of our little villa, helped us make arrangements for transportation and kept us informed of any changes. She’s great to work with! Great location. Far enough away from the bustle of the Atlantis resort to be peaceful, but within walking distance of what you need. Tam was very helpful throughout the whole process. Certainly a top pick if the beach is a priority. Probably worth renting a car if you are staying at this location and plan on exploring more of the island and escaping the Atlantis bubble, as cab fares can add up very quickly (around a minimum of $25/ride, usually more). - Karaoke and so much more! • Deposit is required at the time of booking, Balance is due 30 days before the arrival date. • Rates are for 2 people. 3rd or more charged $50.00 per night . No additional charge for children under 13 years of age. • Minimum 3 nights stay required. • Bookings for 14 days or longer receive a 10% discount. • No pets allowed • Please note that the cleaning fee charged applies to checkout.